It has been a little while since I last posted in this topic. Life happens and gets in the way of best intentions sometimes. I have finally set up a planner for my blog posts to help me be more efficient in this area. I have been very surprised at the response about my kitchen post. It would seem that our family is not the only ones thinking of scaling back to the basics. When you look at the picture above, what do you notice? There is little excess. In fact, there is no excess that is visible in the photo. Can you imagine how easy it would be to keep this space clean? Think of how peaceful your time would be when spent in this room. Tonight, I wanted to continue the Simplicity Goals series with the livingroom. I remember when visiting Katie and Levi Schwartzentruber, as you entered their home, the first room you entered was the livingroom. Hardwood floors were the norm throughout their home. Katie often mentioned to me that the wooden floors were more practical and easier to maintain with a family. There livingroom, unlike most homes today, did not have a lot of seating for guests. There were two rockers, both near a woodstove. These were where Levi and Katie would sit. The children typically sat on a bench or on the floor. In the corner of the room, Katie had her treadle sewing machine and oft times, there was a quilt set up on the frame to be hand quilted. 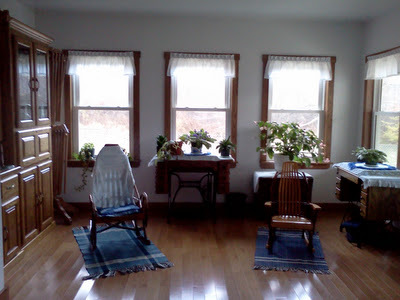 When chores were done, or during a quilting bee, chairs and benches from the kitchen were brought in and placed around the quilt frame while the ladies worked on the quilt. I remember how welcoming the space was. When the number of guests was more than the livingroom, chairs were brought in. Often, there were wooden chairs on the porch that could be brought in. Chairs from around the dining table as well. Just as with the quilting bees, chairs were brought in as needed. On a daily basis though, the room was kept with the minimal furniture. This reflected the Amish beliefs about not being given to excess. Yet, we can learn so much from it today. How often do we allow ourselves to be caught up in the wants and expectations that our society dictates? We have become convinced that we must have all the comforts we can afford. There are often times a feeling of needing to have just the right decor in our home. How many of you know of someone who routinely changes their room decor to match the seasons? I am not saying that this is a bad thing. It just isn’t for me. I look at not only the cost of the decor items, but the amount of storage required when these items are swapped out each season. Then, you have the maintaining of the items, or their replacement when worn or damaged. Katie had a very simple way of decorating. She did it with quilts. A lightweight quilt draped over the chair not only added color to the room, but provided a back cushion as well. On chilly evenings, it was readily available to wrap around the shoulders for warmth. Her windows had simple black fabric for curtains. The fabric was heavy enough to keep the chill at bay. In summer months, she might put up white fabric curtains that were a lighter weight to allow the breeze to come through the opened windows. On her floor, a simple braided rag rug was the only covering. One placed near the door, others at the rocking chairs. Again, this is what brought color to the room. I look at the picture, as well as my memories of Katie’s home, and I find inspiration. With the lack of “stuff” cluttering the room, Katie did not have to spend endless amounts of time cleaning. She had too many other things to do! I can tell you from experience that having a house cluttered with excess, on top of doing chores without the benefits of modern conveniences & appliances, is overwhelming. You spend so much time staying on top of the household chores that the garden or other tasks can suffer from neglect. Katie not only maintained her home, she used the treadle sewing machine to make all of her family’s clothing, she gardened and home canned the harvest, she baked breads and pies almost daily to feed a family that included 7 children, and she did all the typical things that a Momma does. Laundry was done in a gas powered, wringer washing machine, then hung up on the clothesline to dry. Because the clothing is made mostly from a cotton fabric, of poly/cotton blend, it needed ironing as well. She had a busy enough day ahead of her, even with the help of her oldest daughters, that excessive clutter would have been a hindrance. How often do we find ourselves feeling overwhelmed? How often do we wish we could have less time cleaning and more time to pursue other activities? How easily could we gain that extra time if we simply removed some of the clutter and excess from our homes? To me, that picture above is close to the ideal livingroom. Only the essential items are present. Everything has a place and everything is in its place. It is peaceful and serene. I could easily be able to relax in that room. What about you?